Director Paul Feig is just too excited to keep quiet about his Ghostbusters reboot starring Melissa McCarthy, Kristen Wiig, Kate McKinnon, and Leslie Jones. Over the past few weeks, he has revealed the updated Ghostbusters uniforms and proton packs, as well as the new Ecto-1. He even posted a photo of his cast after a very long day of busting ghosts. Feig better not have any aspirations of directing a Marvel movie; barely a month into shooting, and we already know way more about this project than Age Of Ultron throughout its entire production. 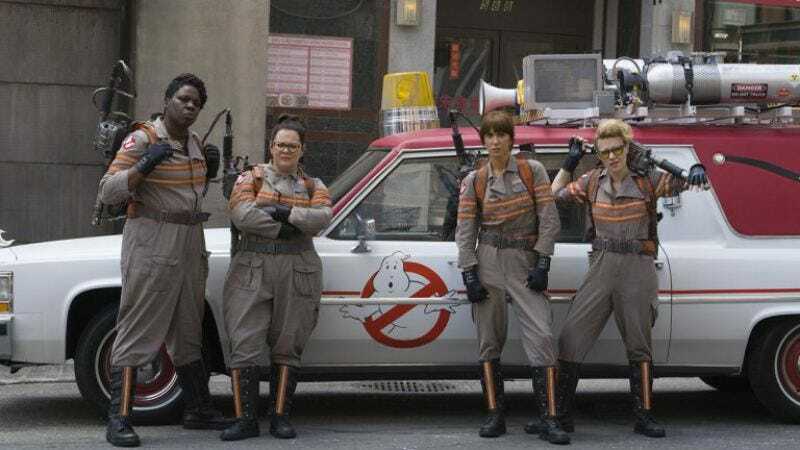 In his latest social media reveal, Feig provided the names of the four main characters, putting us on a first-name basis with the ladies we gonna call when the ectoplasm hits the fan: Erin Gilbert, Jillian Holtzmann, Abby Yates, and Patty Tolan are the new crew of proton pack-lugging vigilantes. Because there’s a (likely studio-imposed) limit to Feig’s loose lips, there’s no word on which actress will play which character, but The Hollywood Reporter reports that McCarthy has been seen wearing a Yates nametag in on-set photos. Despite all of Feig’s mini-spoilers, there are still plenty of mysteries to crack about the film. Andy Garcia will reportedly play the mayor of New York, but no one really knows what Michael Kenneth Williams, Matt Walsh, and Cecily Strong will be doing in the film. And we know Neil Casey will play a villain, but which villain? And what about the name of the receptionist Chris Hemsworth is set to play? Knowing Paul Feig, we’ll probably have an answer by the end of the week.